The moment we’ve been waiting for has finally arrived: Edward Enninful’s first-anniversary issue at British Vogue. It’s hard to believe his first issue starring Adwoa Aboah debuted just 12 months ago — and what a ride it has been. Enninful has given us everyone from Taylor Swift and Oprah to the Beckhams and Cara Delevingne. Now, going all-out in true celebratory fashion, he gifts us not one, but four covers for December 2018 — all of which were photographed by forum favorite Steven Meisel. 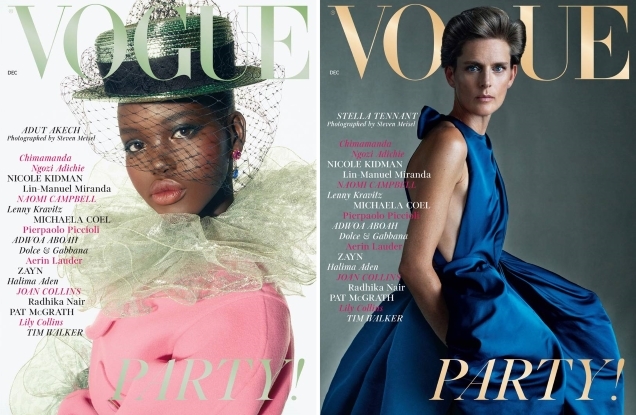 Adut Akech (shortlisted for Model of the Year), Stella Tennant, Saffron Vedher and Primrose Archer each appear solo on their respective covers, decked out in everything from Marc Jacobs to millions of dollars worth of Chopard jewels. Which cover is set to disappear from shelves first, you ask? Members of our forums were quick with their predictions. “Adut’s cover is beautiful! I love everything about this. I couldn’t care less for the other ones…” said GinAndTonic upon checking out the four covers. “I do enjoy all the covers a lot but Adut and Saffron won for me!” Blayne266 wrote. “I really love Adut’s cover, but Saffron is such a beauty that it’s hard to choose which one is my favorite,” chimed in jorgepalomo. GERGIN couldn’t have agreed more. “Adut and Saffron are my top two favorite cover choices!” he voted. “Wow that Saffron girl is gorgeous! Her cover stands out the most for me,” raved fluxxx. “Saffron is the winner here,” applauded liv4beauty. Which cover will you be hunting down at the newsstand? One in particular — or all of them? Sound off here.